Former guard Silas Melson, who graduated after last season, traveled to Spokane during a hiatus in his professional basketball schedule. Melson first signed with Lavrio of the Greek Basket League in June of last year before he signed a one-month contract with Hapoel Be’er Sheva of the Israeli Premier League in December. He called it a business decision to leave Greece after the team wasn’t successful. 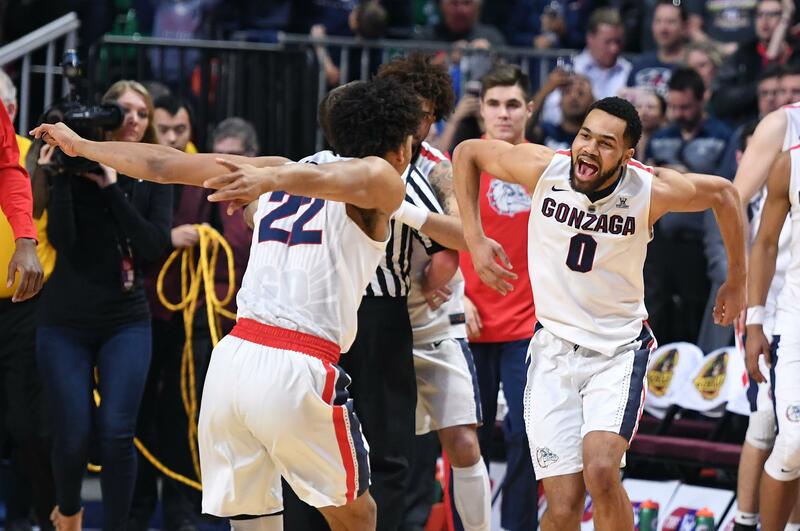 He was welcomed back to the sold-out Kennel with an appearance on the video boards and raucous applause, but he was more excited to see his old teammates and college program live in action. This team has been compared to the Final Four team of two years ago, but outside of wins and talent, there is one stark difference. The 2016-2017 team was first in defensive efficiency (according to KenPom) and 10th in points allowed at 61.5. On the offensive side, they were 16th in both efficiency and scoring. This season, they are first in scoring and offensive efficiency. Defensively they are 39th in scoring and 20th in efficiency. One of the holdovers from the Final Four team is redshirt senior Josh Perkins who just passed Blake Stepp for second in assists in program history. Melson and Perkins were both guards who were recruited in the same year. Perkins was just thrilled to see his friend. “Same guy, he is obviously my brother, big-time surprise (seeing him),” he said. “I am glad he is healthy, still playing ball and still came back to check on his boys and say what’s up. That’s my dude. The one player Melson mentioned that pops out every time he watches is redshirt junior Brandon Clarke. Melson practiced against Clarke last season when Clarke was redshirting, but obviously the rest of the country hadn’t experienced him in a GU uniform until November. Melson isn’t shocked to see Clarke put up numbers, but he didn’t expect it so quickly. As for what he misses most, Melson misses his brothers and the environment GU cultivates. Published: Feb. 10, 2019, 6:27 p.m. Updated: Feb. 10, 2019, 10:16 p.m.